The lo mein I bought are not the fresh ones but the dry ones. I'm Italian so at the first I have tried to cook them in the same way I usually cook spaghetti: boil them and then remove the water and then put them in the wook with the other, already stir-fried ingredients (oil, garlic, tomatoes etc ... ). This does not look to be the proper way since the result is overcooked and the lo mein is sticky, so I guess I'm doing some big mistake. 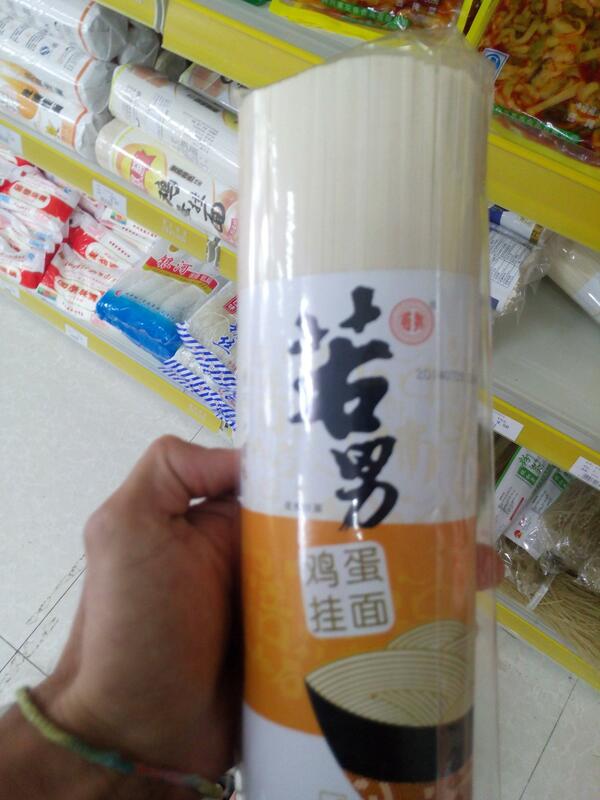 I kept photo of other available noddles, maybe you can suggest me something better that my first choose. OK I can read Chinese and let me tell you the answer: the noodles you bought are made by eggs. They're not made by rice. (FYI, there are TWO kinds noodles called "Rice Noodles", they are actually made by rice. 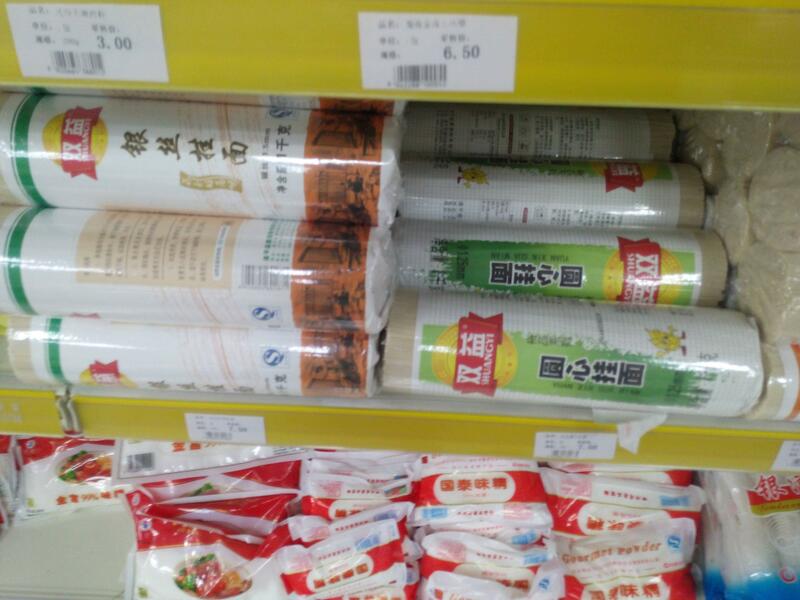 The two kinds varies in thickness). You can first make soup noodles to grasp the texture of the noodles you bought. Try undercook and overcook a bit, see if you can find the sweet spot you want. Add a bit of salt into the water. This helps taste and prevents the noodles absorbing too much water. Put the noodles in and cook them for 30s to 1 min. Never (very important!) cook them for more than a min. Take out the noodles. They should be undercooked now, which is good. Use a scissor to cut the noodles, otherwise you'll have very long noodles later in the process. There is no need to rinse them using cold water if you use this method. You can turn off the heat to the water pot now. But don't throw it away. Cook the meat ingredients in the pan. Add a slight amount water from the pot (which has salt and oil in it) to the pan. Also add sugar, soy-sauce, etc. for final adjustment of taste. Now put the noodles into the pan. If done correctly, all the water (should look like soup by now) should be absorbed into the noodles right away. Cook the noodles a bit. When the noodles are around 80~90% done, add the vegetables. When the vegetables are done the noodles should be done as well. Finish! As for Lo Mein, it's not a kind of noodles, rather a style of cooking noodles. When making "Lo Mein", the noodles are only cooked by hot soup. A "Lo Mein" dish is where the noodles are cooked by a minimal amount of water. It's like serving soup noodles but without the soup. The procedures are largely same as above, except the noodles are put into the pan at a later stage and only briefly fried, or not fried at all. I personally consider "Lo Mein" a more difficult dish than "fried noodles" (aka "Chow Mein"). Boil the noodles until almost done, then rinse them thoroughly in cold water to wash off the surface starch. Toss with a little oil (sesame is nice) to prevent sticking, and leave in the colander to dry out further. Then stir fry when ready. As far as my experience goes, at least Chinese and Vietnamese noodles are often (if not always) very sticky and you have use a lot of oil to prevent sticking. If the texture seems to be ok but the noodles stick together, the noodles are not overcooked. 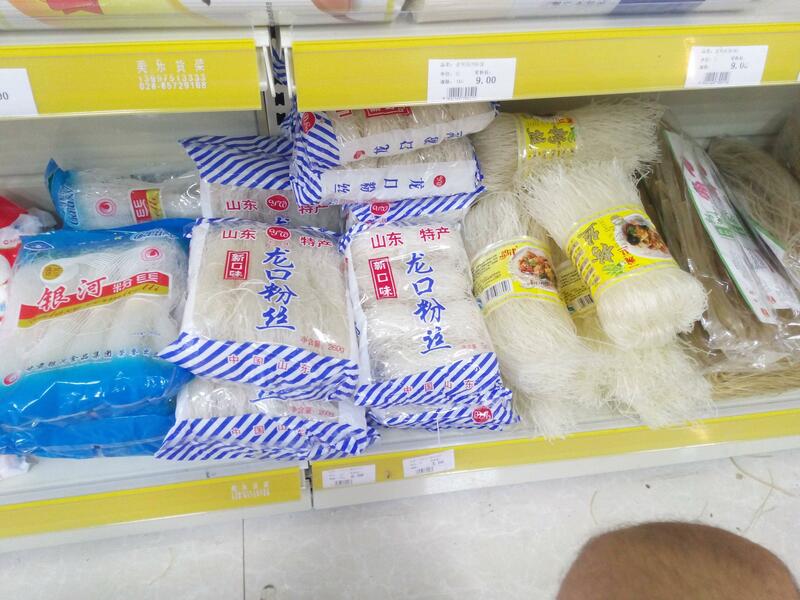 EDIT: If you are unsure whether these are wheat or rice noodles: put some into luke warm or cold water and look after an hour or so if the noodles turned whiter. The water should stay clear. If so, then you have rice noodles. If you have rice noodles: Put you noodles into lukewarm or cold water until they are flexible, but not soft. Then stir-fry the noodles until done. And please use some some oil to prevent sticking! The term "lo mein" comes from the Cantonese lou mihn (撈麵), meaning "stirred/tossed noodles." In Mandarin, it's typically referred to as "拌麵 (mixed noodles)." You can use the same type of noodles for lo mein and chow mien. Wheat noodles with egg is the typical type of noodles used in these dishes. Fresh egg noodles (preferably ~1/4" thick) are ideal for lo mein, while fresh or dried noodles can be used to make chow mein. With either, the noodles need to be softened via boiling before cooking. For dried noodles, it's recommended to parboiled in (boiling) water for ~5-6 mins before cooking, fresh egg noodles or the other hand only need ~2-3 mins. The necessary amount of cooking time will vary depending on the thickness of the noodles, so refer to the packaging for instructions. You can refer to this guide as a reference to the different types of wheat noodles and their suitability in cooking. The ultimate goal here is to boil them until they are just cooked, but not too soft (treat the noodles like pasta and cook them "al dente"). Cooking chow mein noodles involves to fry them into pancake of sorts, and then pouring stir-fried meat and vegetables over the fried noodles. This is similar to how Japanese yaki-soba is made, which is considered to be a derivation of chow mein, but with it's own unique distinction. However with lo mein, the parboiled noodles are typically added near the end of cooking to be heat through (as opposed to bring fried) and tossed with a sauce and also tossed other ingredients (or have the ingredient poured over after the noodles have been tossed). Contrary to what people say, when cooking chow mein, the noodles are fried separately albeit not to a crisp, but simply to coat it with oil and give it better texture. The frying stage is skipped when making lo mein. The crispiness of the noodles is not the distinctness that sets the two types of dishes apart. What sauces you use and what ingredients you use it ultimately up to your tastes. Typically dark or light soy sauce, oyster sauce, chili sauce is used. Using sesame oil can help enhance the flavor of the dish with it's fragrant scent. The second picture you posted (first after the edit) is "la mian." These types of noodles are more suitable for soup dishes, Japanese ramen is derived from these types of noodles for Japanese tastes as chuuka-soba. The types of noodles noted in the last few images are called "fen si" (粉丝, the thin ones) and "fen tiao" (粉条, the flat ones). 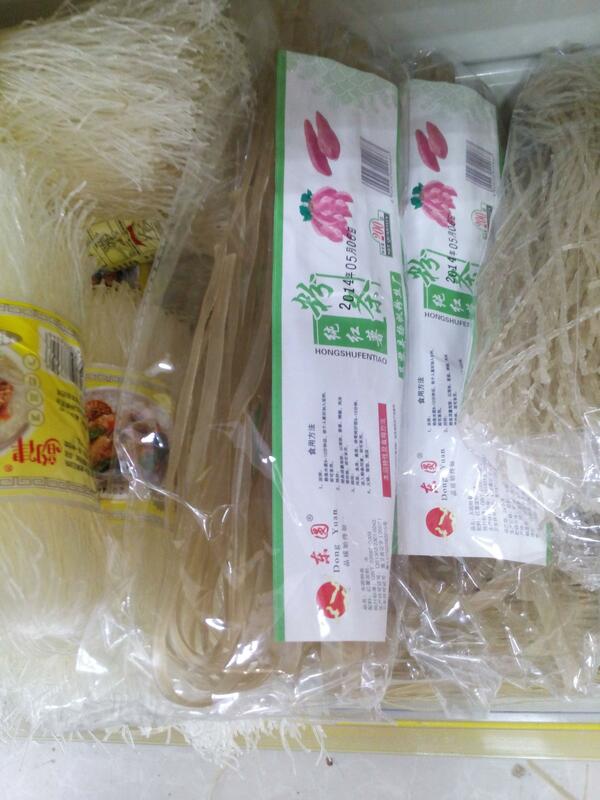 The former and latter is what is know as "cellophane/glass noodles/vermicelli." Both are typically made from mung beans or sweet potato starch. Both are usually stir-fried or served in soups and typically found in supermarkets in a dried form. The latter is usually thicker than the former. 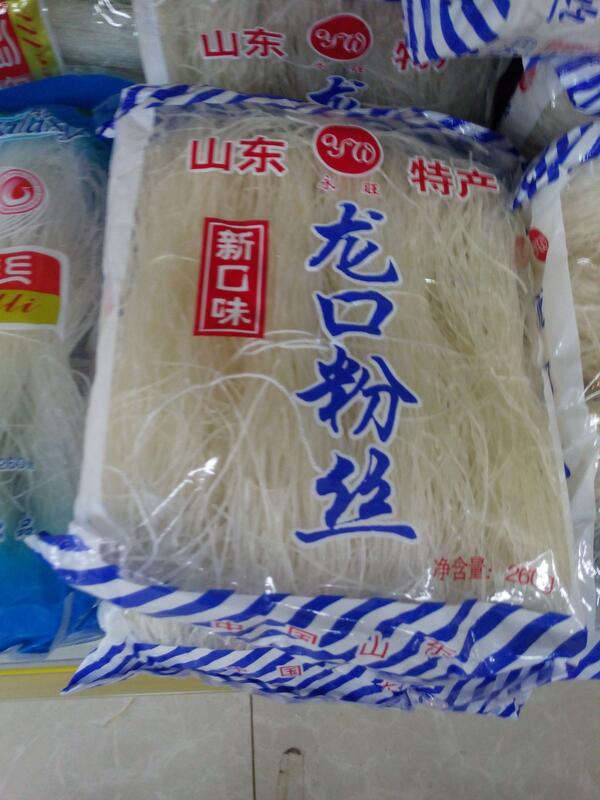 While a distinction should be made between 粉丝 (fen si) and 米粉 (mi fen) is that mi fen is vermicelli made from ground rice, it's most likely that people will assume you mean the type with the bean/potato starch over the latter made from rice starch when you say "fen si". Not the answer you're looking for? Browse other questions tagged pasta chinese-cuisine noodles spaghetti or ask your own question.